Getting started on Artificial Intelligence can be a little overwhelming. Read on as Babu Thiagarajan, Country General Manager and Head of Technology, Fidelity International, India demystifies Artificial Intelligence for us. Artificial Intelligence (AI) has garnered a lot of attention lately. Most of us recognize AI as the technology behind the autonomous cars, facial recognition tools, chatbots, etc. We spoke to Babu Thiagarajan, Country General Manager and Head of Technology, Fidelity International, India to get you all the details that would help you to understand the AI risks and opportunities to distinguish between AI hype and reality. Q: What does AI mean to you? What should business leaders, employees, individuals know about this technology? AI is a means to significantly improve the experience for our customers and employees in whatever they do today. As it delivers on its promise, then it will also be about creating new experiences for our customers and employees, experiences that they have not had so far, or experiences they have not imagined yet. If it does that, then for businesses, it removes bottlenecks and inefficiencies, shows resolution paths that weren’t visible before, and shows opportunities - business models and new products and service offerings that weren’t possible earlier. This eventually would result in higher customer satisfaction, better profits and quite simply, survival. Lastly, individually it means I need to unlearn and learn new competencies. It is an opportunity to re-energize my career. And If I don’t seize this, someone else will. Q: How is AI helping us? What are some AI capabilities that are impacting business productivity and profitability? Artificial Intelligence is a collection of technologies that enable machines to sense, comprehend, act, and learn on their own or by augmenting human activities. For instance, out of the five basic human senses: Sight (vision), hearing (audition), taste (gustation), smell (olfaction), and touch (somatosensorial), machines can already do Sight (image processing) & hearing/talking (natural language processing / generation) very well. This implies that machines can now recognize objects, navigate (e.g., a car), collaborate (e.g., translate between languages), analyze data, and recognize patterns (e.g., Detect crop diseases). On a more tactical timeframe, AI will accelerate automation of residual manual processes and will make those processes to be more accurate and faster, and learn on its own to reduce human intervention for exception handling, etc. All these tasks that humans used to do with primary human senses can now be done by machines with better accuracy, thereby improving customer satisfaction, team productivity, and consequently profitability from a company’s point of view. Q: What are some AI tools and products used in organizations besides Chabot? A chatbot is not a pure AI tool; it is an AI-powered communication tool. Some of the AI techniques used behind chatbots are Natural Language Processing, Natural Language Generation, Topic Mining, and Sentiment Analysis. Organizations are applying all these along with other techniques like anomaly detection to detect frauds, predict server failures, forecasting methods to refine the plan for next cycle of processing, deep learning to understand the complex set of connected events, clustering to redefine the consumer segmentation & product offerings. These are some of the areas we at Fidelity International are looking to apply in our investment management and our operational processes. Q: In what ways has AI impacted or is expected to influence the business? In short, everything! Think of AI as the next leap of computerization. Today we don’t think of computerization as distinct from anything we do. It is ubiquitous and in fact, the absence is what bothers us in organizations and in our daily lives. AI will similarly be ubiquitous. But the difference is that it will be less visible physically, as its role is more behind the scenes to take current experience levels of computerization to a much higher level. Many organizations will be able to serve a growing number of consumers, hence shifting the demand and supply equation in many industries that may lead to business consolidations to readjust the scale and spectrum of services. Simply put, AI will improve the productivity of organizations. E.g., Decision support AI will increase accuracy, and hence productivity of teams. Interaction AI will improve customer and employee experience, as services will be delivered proactively, customized to the individual. Chatbots and AI-powered workload planners are going to change the way employees interact with each other and with systems. This will also redefine the role of managers and supervisors. It has become the source of new enthusiasm and positive energy. It is giving a new career edge to otherwise data heavy careers. Forcing organizations to learn, access, and adopt at the same rate as universities. It is helping in skill segmentation and creating effective learning paths. It is helping in screening and profiling. Q: There is a lot of buzz or fear created by the arrival of AI. It is expected that AI will replace humans. How much do you agree with this statement? There is merit in the statement that AI might replace humans in some jobs, but humans will always have the ability to adapt on their side in this competition. It is our “survival instinct” that is our edge over machines. As the environment around humans changes, we will find ways to become better suited to the new environment. We have always done it, and we will continue to do it. So rather than looking at AI as something to worry about, let’s see it as a challenge, an opportunity to become better. Another way to look at it is to focus on the immense potential that can be harnessed for human betterment from this technology, before it can become a potential threat to human existence. E.g., these technologies can help the blind to navigate better, to identify cures that have proved elusive so far, and so on. Q: Where does India stand in the globe regarding leveraging AI and creating an impact? Learning and developing AI-based solution requires a knowledge and skill in foundational areas such as mathematics, data, programming, and functional knowledge. While India has traditionally been very strong in generating these foundational skills, we are only in the early stages of how to leverage these foundational skills into building an AI competence. A parallel - in the first couple of decades of the emergence of the offshore industry, we had millions of software engineers, but very few product innovations. That has changed in the past few years. Similarly, we have a lot of mathematicians, statisticians, programmers, etc., but we need to do more to join them all up to create an AI competence. We, each Indian Tech or Services organization and university, have to carefully shift our skills from traditional software development to AI-enabled business solutions. The good thing is that we are already seeing the first steps of that building process. The added advantage of the supply side dynamic that India offers is that we can create an AI competence at scale and at relatively low costs. This will help to reduce the cost barrier for adoption of this emerging competence globally across both developed and developing economies almost in parallel. Regulation permitting, we see this scaling dramatically in the next 18-36 months. Q: How and in which processes is your organization leveraging AI? What’s the rationale behind using AI in the processes / tasks? First, creating better value and generating better alpha. If we deploy AI to assist our investment management process, we can significantly improve the value we have created for our customers. Second, automating current manual processes with the intent to increase responsiveness to our customers, and to reduce costs. This will cover a broad spectrum - user journey analytics, last-mile automation using RPA, customer service workload prediction, sentiment analytics, candidate screening and so on. Third, improve customer experience using Artificial intelligence. Chatbots are the kind of first AI implementations at most firms. But there is more to come by leveraging the entire suite of AI technologies - NLP / NLU, inference engines, video analytics, and so on. Q: How ready are organizations to face the talent imperatives arising out of incorporating AI? Many service / product companies, like Google, IBM, Microsoft, have started providing off-the-shelf AI-based solutions that can be easily incorporated into existing business solutions to increase productivity. This approach does not need a massive talent in AI. You need right people to be able to integrate the AI-based solutions. Most of the organizations are using or seriously considering this approach. However, for competitive advantage, most of the organizations should develop this capability in-house as well. Defining an internal AI strategy or approach needs management attention as a priority. Execution aspects such as identifying focus areas, re-skilling / upskilling talent etc. will need to follow that strategy / approach. While many organizations are dabbling in AI, they are approaching it as a fashionable aspect as opposed to making it an integral part of their business strategy. Lastly, and most critical, the success of AI depends on the data that is available to your organization. It will be easier to add or partner for the AI skill, but solving the data problem within organizations cannot be delegated. So that has to be a part of the competence creation process in organizations. 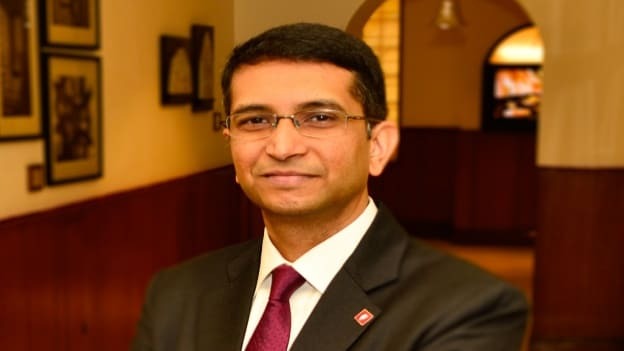 Babu Thiagarajan is the Country General Manager and Head of Technology, India at Fidelity International. NEXT STORY: Will technology be able to solve the engagement challenge?